To delight the eye as much as the palate, we arrange seasonal tastes in delicate Japanese style on traditional Arita-ware. Enjoying the best foods at their best, the season of the year is the prime factor in Japanese cuisine. 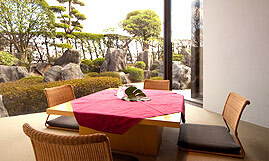 A separate room opens to Japanese garden is available. Share the beauty of the sight at the day and the night. 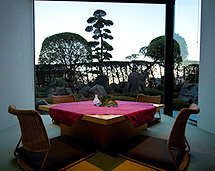 Mastery of Japanese cuisine, Sato had improved his career at high-class Japanese restaurants in Osaka where, once said central kitchen of the nation, then he played important roles in famous Japanese inns and hotels. 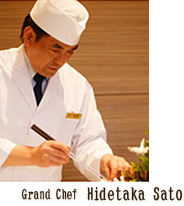 His works are always highly-esteemed for a delicate art on the fusion of Japanese styles and Western styles.His motto is to serve surprise to guests through bring out the natural taste of the ingredients without too much cooking, and beauty of the display and arrangement of the food in season sense. As you open drawers one by one, a cuisine appears. An elegant and a fancy lunch served with traditional Japanese lunch box. Dishes of in-season ingredients are served from the sensitivity of the Grand chef. Menu changes every month. A pride of our group, master of Chinese serves refined and dynamic cuisine at "Seikarou." Degust Chinese cuisine of Japan second to none. 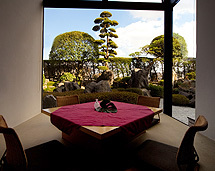 Enjoying a splendid view of the Kumamoto city from the table, be with somebody you cherish. The crunchy texture of shark’s fin, refined top-grade Chinese soup stock (chi: Shang tang) and gentle of club meat create an exquisite harmony for gourmet. Tender and tasty beef sauteed with hot sweet Chinese soybean base source, "Kim jan."Taste with refreshing cucumber, stuffing the beef in Chinese buns. Restaurant "Natura", offers an original and creative cuisine full of selected materials and seasonal greens.You can relish seasonal and home-style tastes which nature has bestowed upon people. 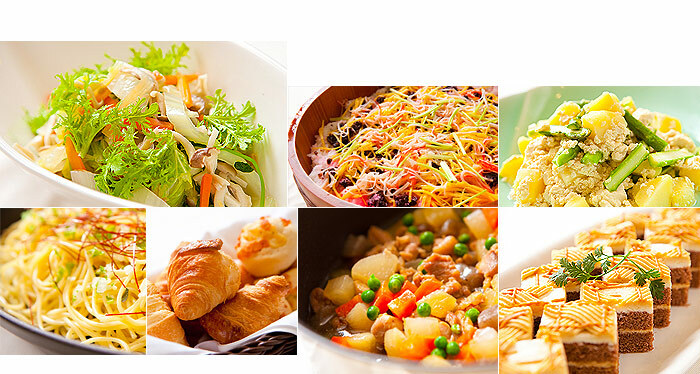 Choose your favorites from variety of dishes in our menu. Dishes with seasonal vegetables are cooked focusing on natural aspect of foods such as "just a touch of sweetness" or freshness. ●Wooden decor makes you may feel sense of warmth. The warmth preserved by a wooden interior decoration creates a calm atmosphere in which to savor our dishes made with all natural. Crane Cafe, a bright and cheerful coffee shop. 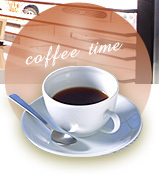 Enjoy freshly-brewed coffee, soft drinks and irresistible selection of sweets, in relaxing atmosphere. 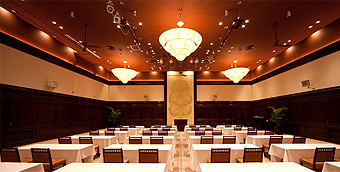 Main banquet room is very spacious with ceiling height at 6m/20 ft, with floor at 552 sqm/6,000 sqft. 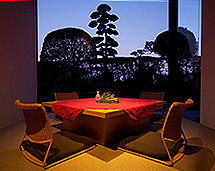 Artistic lighting and reliefs of palm trees provide a cozy atmosphere. Homey and warm atmosphere, medium scale banquet, "The terrace room", still it offers sophisticated and chic sense against daily life. 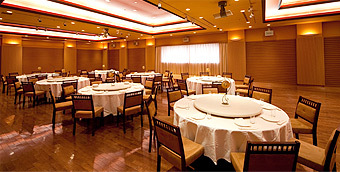 "HIKARI" Room is spacious soft light-drenched which accommodates 600 people in case of standing party or reception. A sophisticated, elegant and simple room setting is easily adjustable according to the purpose of the gatherings. The most advanced lighting technology and dramatic lighting techniques are available to help impressing attendants. The 2nd floor is gentle light-drenched spacious hall. The 3rd floor is homey atmosphere suitable for "House wedding". 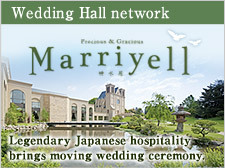 According to your request, you can select banquet halls. And also, hair & makeup salon to help bride’s dressing and makeup and Photo studio with professional camera crew are available.